I is for idea. This crystal award celebrates innovation, invention and ingenuity. This award is designed to resemble the letter “i”, accept instead of the traditional circle at the top we crowned it with a crystal diamond. 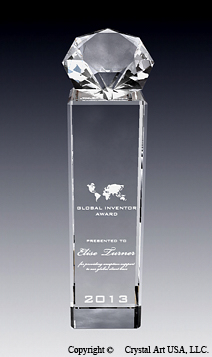 Our brilliant idea award will impress with its elegant design and the sparkle of the crystal diamond facets. The crystal pedestal offers generous space for engraving and personalization.